Mamacita, donde esta Striper Blitz? I want a keeper to retrieve. Mamacita, oh where is Striper Blitz? Cause maybe they’re up on the beach. Hoping they’ll come within my reach. Oh where’s the Striper Blitz? Alright, Mamacita. I’ll keep casting now. Lyrics by Fred & Frank Abatemarco; Graphic Design by Chaweenee Cecchini (With kudos and apologies to vocalist Augie Rios, the Mark Jeffrey Orchestra, writers George Scheck, Rod Parker, and Al Greiner). 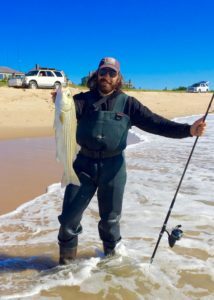 September 12, 2018: For Montauk surfcasters, the Jewish High Holy Days are the ceremonial start of the fall surfcasting season. So, I ask you: this you call a beginning? What kind of chosen people choose wet, windy and wild weekends? Instead of the celebrated Rosh Hashanah “blitz”, we got a veritable Rosh Hashanah “schvitz”! Not that we surfcasters haven’t suffered during past Jewish New Years: 2013, for example. 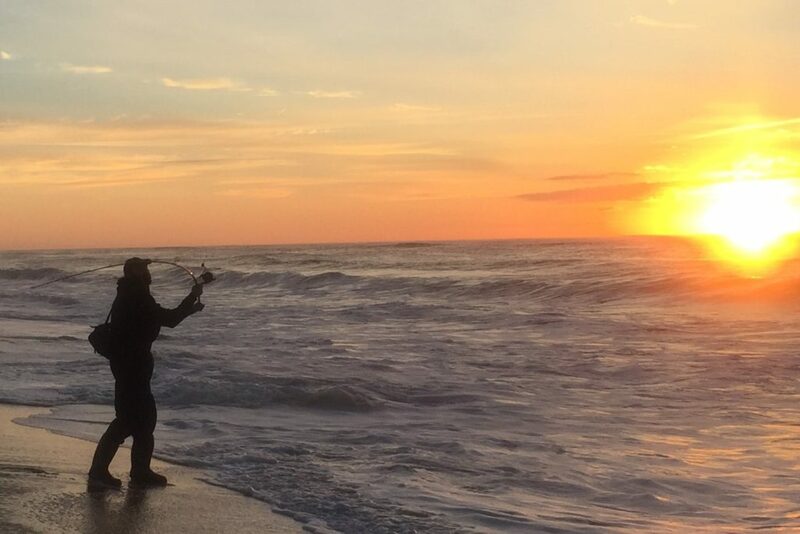 However, over the course of many, many years, Rosh Hashanah is the surfcasting season’s better than even chance at many, many fish. So why, for heaven’s sake, is this year different than this one, or that one, or any other in the recent past? But perhaps it was to be expected after the somewhat tepid summer in the surf experienced by The Faithful. 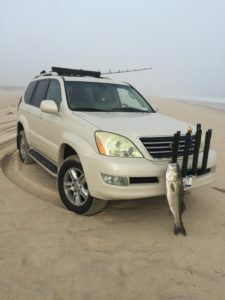 Despite their best efforts to feed my smoked bluefish fetish, from May to August their take was lots of short bass, only a handful of keepers, and not nearly the bumper crop of bluefish compared to previous years. Certainly no “fourties or fiddies” for us daytimers. 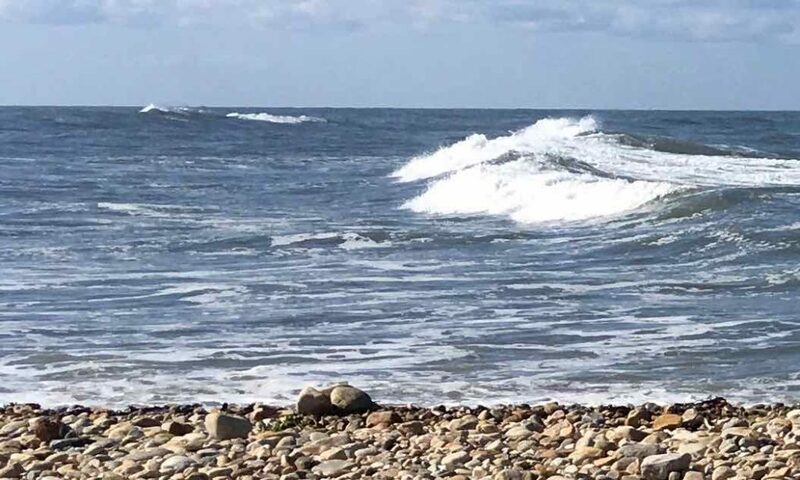 Now, with September not nearly halfway done, and Labor Day weekend’s hot, hazy and humid heat wave only recently behind us, a gnarly nor’easter blew in for the Jewish Holiday weekend. It should have brought God’s good grace and forgiveness in the form of cooperative, blitzing fish. 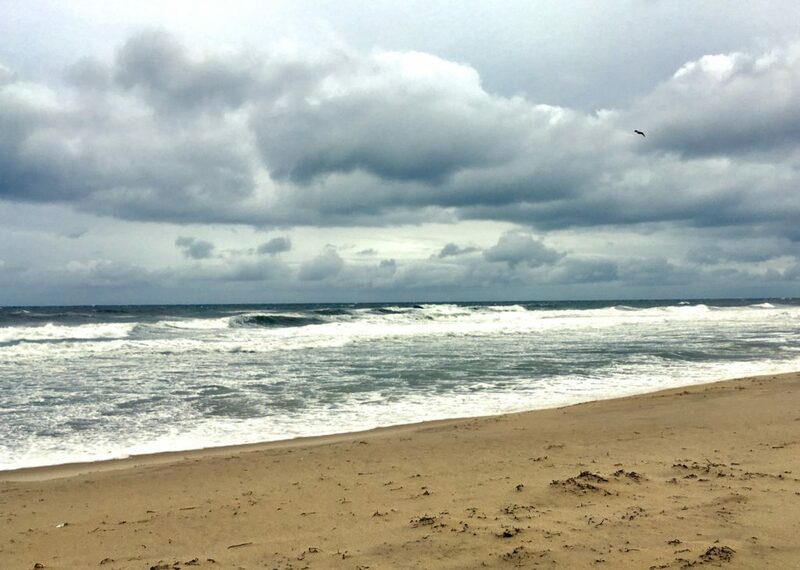 Instead, the storm turned the beaches, and all who dared venture onto them, soggy and sad. All, that is, save LeeBob N. He greeted the wind and the rain as if they were apples dipped in honey. LeeBob is truly one of God’s chosen people to judge by his hard-won results. 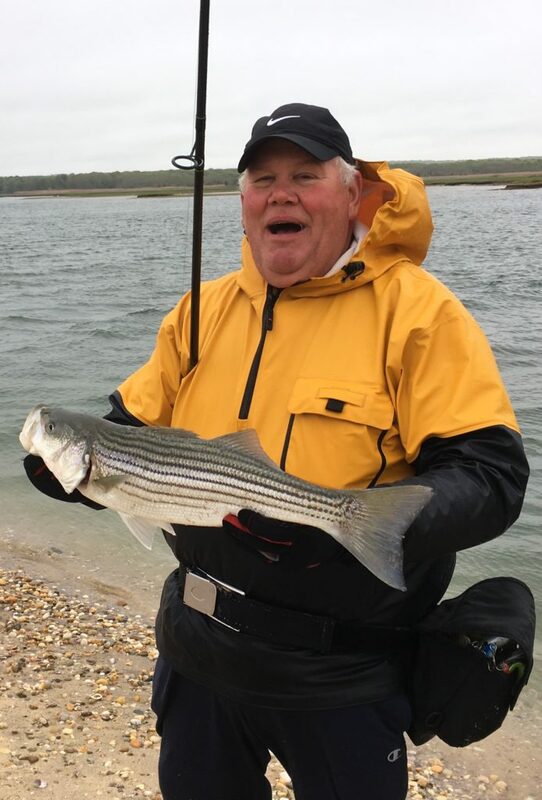 As the storm enveloped the East End on Sunday, LeeBob gleefully fought the incoming tide from a slippery perch bathed in whitewater among Montauk’s south side rock pile. 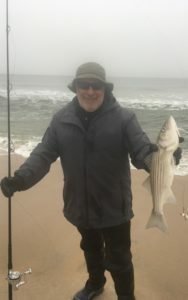 Just before the sundown Shofar blew, LeeBob hooked into a short striper that he landed and then cast back upon the rushing waters to wash away his sins. LeeBob would have stuck around to sweeten his lot—as in more and bigger fish—but the ocean rose ominously around him. Heeding the will of heaven, LeeBob returned home for the evening blessings. 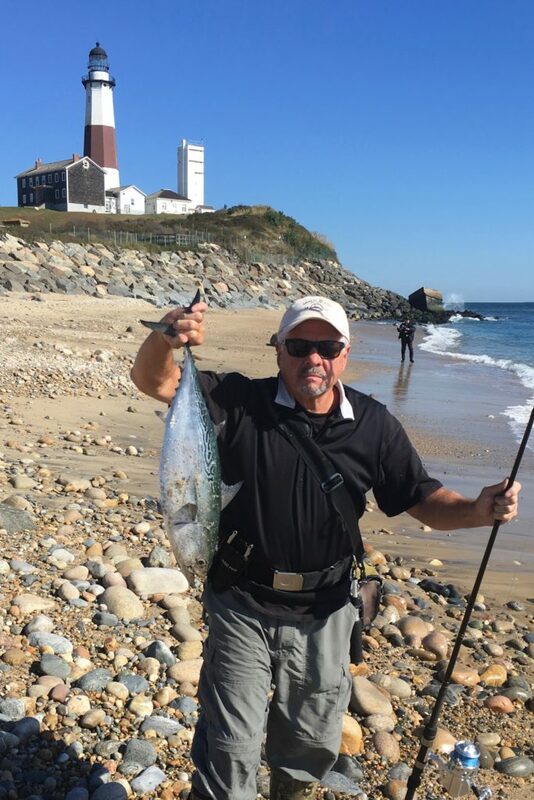 The following day, I joined LeeBob to fish the outgoing tide on the North Bar of Montauk. Wind and rain honked in our faces but did not deter LeeBob’s optimism or enthusiasm. 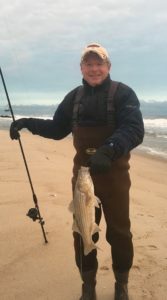 “It’s ON,” he howled above the wailing windswept waters as a schoolie striper inhaled his 1.5 ounce white bucktail lure. 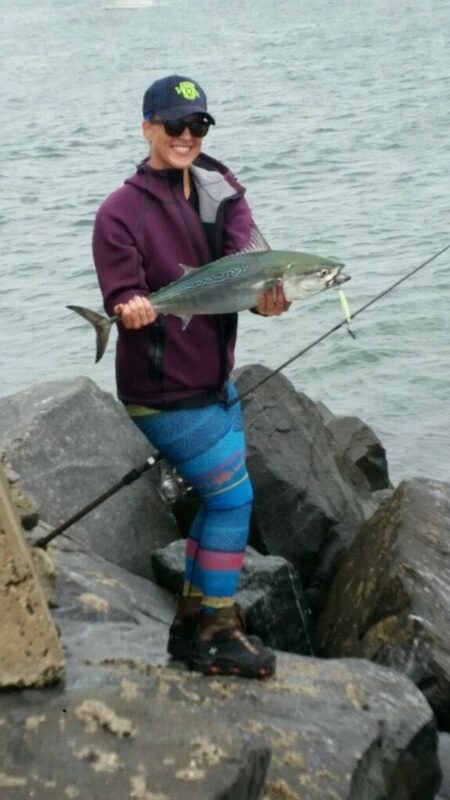 Later, a bluefish with a confused look on it’s devilish face chomped on LeeBob’s line like a pervert on a pomegranate. Both of the fish–and LeeBob–however, were home before it was time to share the fruit and challah. I was skunked the the entire two day holiday. Clearly, repentance is called for in my immediate future. Admittedly, FishTales ain’t no Book of Life. But for my money, LeeBob is destined for a very prosperous future—on the north and the south side of Montauk—this season and beyond. And y’all know what’s next, right? 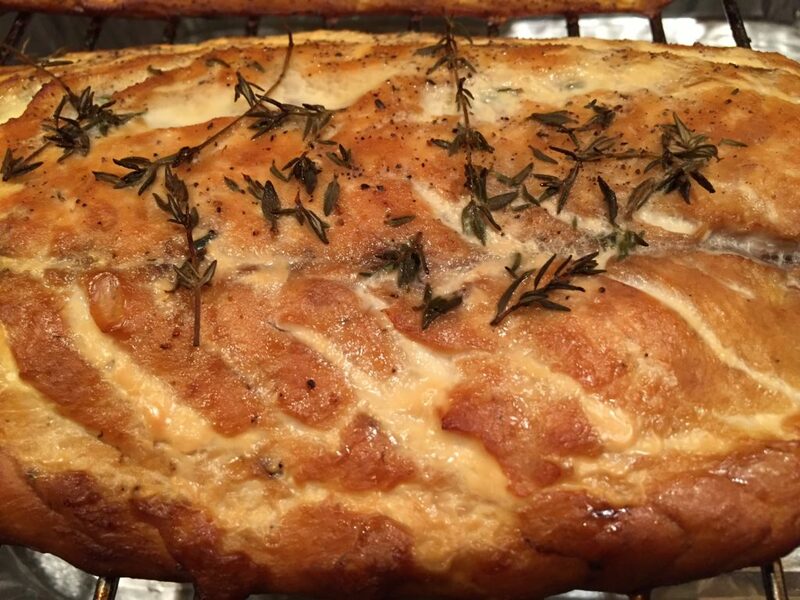 Yom Kipper….come hither! 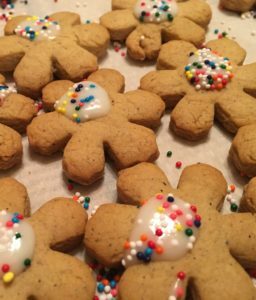 December 23, 2017: Christmas eternally evokes the comfort and joy of family, friends and home. 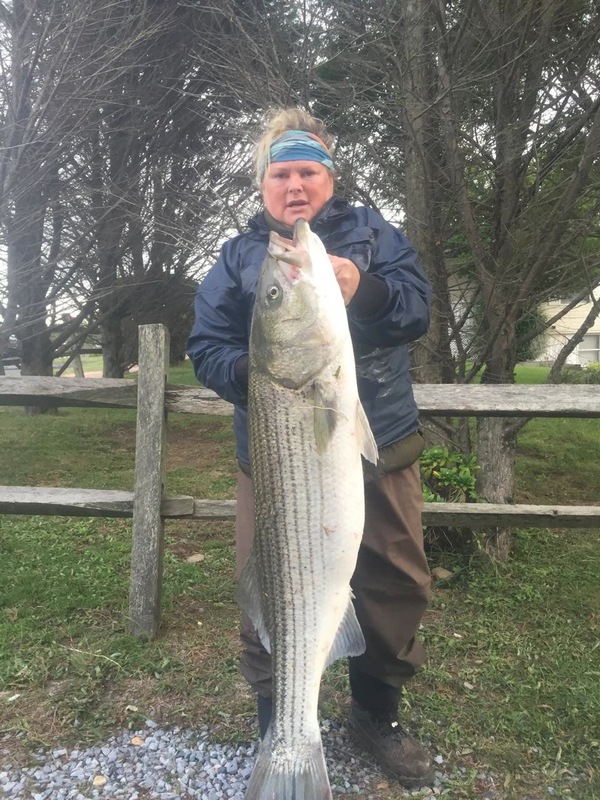 For some, surfcasting for striped bass does all that and more. 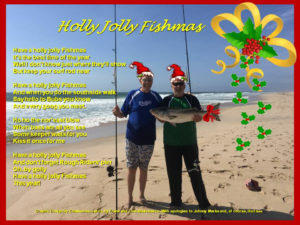 As you enjoy some of your favorite things this holiday season, BBF and I have the pleasure, once again, to offer a glimpse at ours, in the form of our annual Fishmas Card. Jingle jingle, y’all. Fred & Frank & Sister Chaweenee. Graphic Design by Chaweenee; Photo by Verizon Charlie; Lyrics by Frank and Fred Abatemarco (with apologies to Al Stillman and, of course, Perry Como). 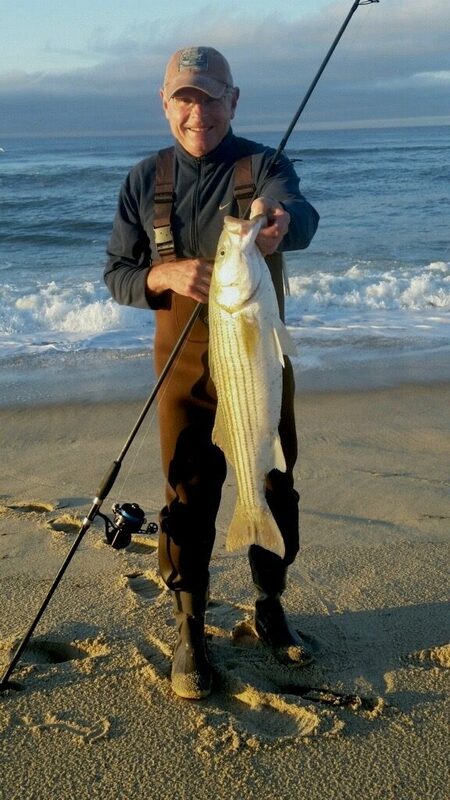 Nothing beats a keeper striper in the foam. Montauk’s Rathole and the full-moon outbound tide. Gee, the big cows are the best ride. You can’t beat bass at home. 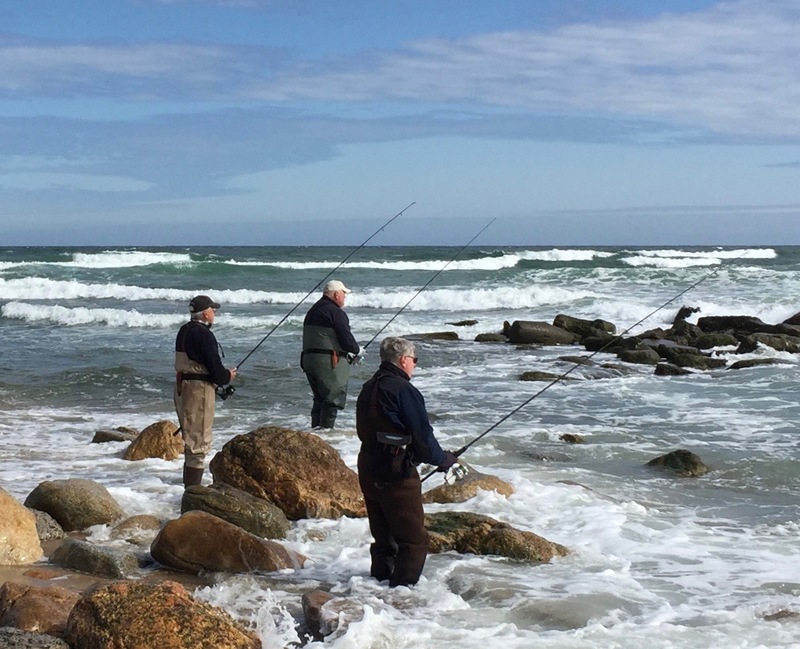 When there’s no Striped Bass or Bluefish to Catch, it’s Albies–or Golf. October 19, 2017: They call it Albie Fever. Or, simply: The Fever. 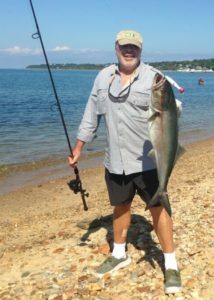 Catching Albies–False Albacore–is an obsession for some anglers. The sleek and football shaped Little Tunny, or Euthynnus alletteratus, are 40-mph speed demons more related to mackerel than to the tuna you are used to eating. They are considered among the most challenging game fish in the Northern Hemisphere. Right now, the East End of Long Island is lousy with them. ALBIE KING: Verizon Charlie smiling with the home field advantage. ALBIE ON THE ROCKS: They joy of jetty fishing. 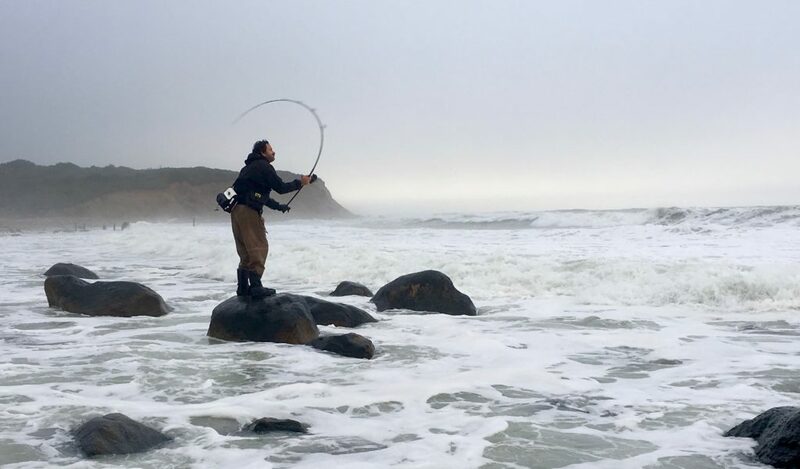 Aficianados of Albie fishing are enamored with the finesse it takes to hook one even when they are blitzing within casting range. If lucky or skilled enough to nail one, an Albie’s running fight defies its size and weight, typically 12 to 18 inches, 3 to 6 pounds. 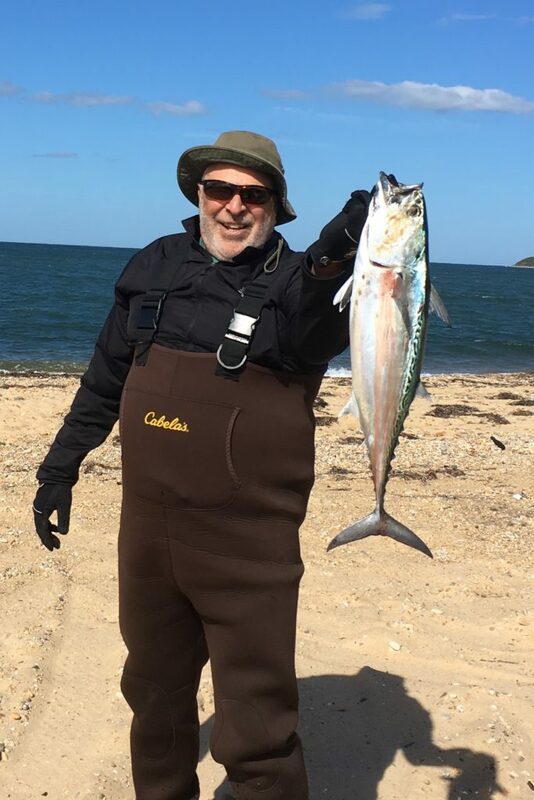 Swift and stealthy, the wide-eyed Albie eschews the big boisterous popping plugs we usually throw to Bluefish and Striped Bass. Delicate, shiny and fast-reeled lures are what’s required. Even then, there’s no guarantee you’ll connect. And if you encounter a pod of them, cast fast and don’t blink. Because Albies can be gone as suddenly as they appear. 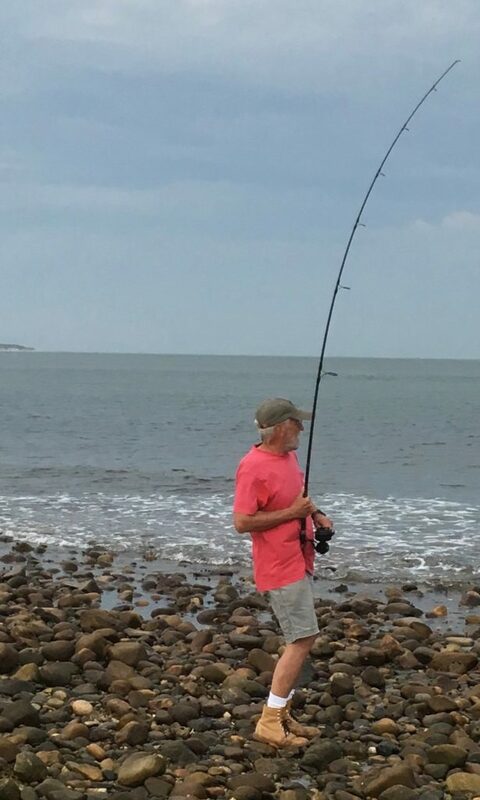 Despite the encouragement of my chum Verizon Charlie, one of The Faithful on the beach and the undisputed king of Albie surfcasting, I’ve shunned chasing them for one main reason: Albies are not good table fare. And by that, I’m being as kind as I can be. I cooked one recently by doing my Anthony Bourdain best: Bleeding it, filleting it, marinating it, seasoning it and finally grilling it. I had four lovely dark-meat loins. I was encouraged by a posting that said “If you like Bluefish, you’ll like Albie”. 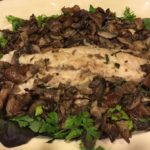 Yet another case of someone who knows absolutely nothing about cooking or eating Bluefish. Despite my best efforts, the Albie was putrid. Sour and gloppy. I wouldn’t feed it to YOUR cat. 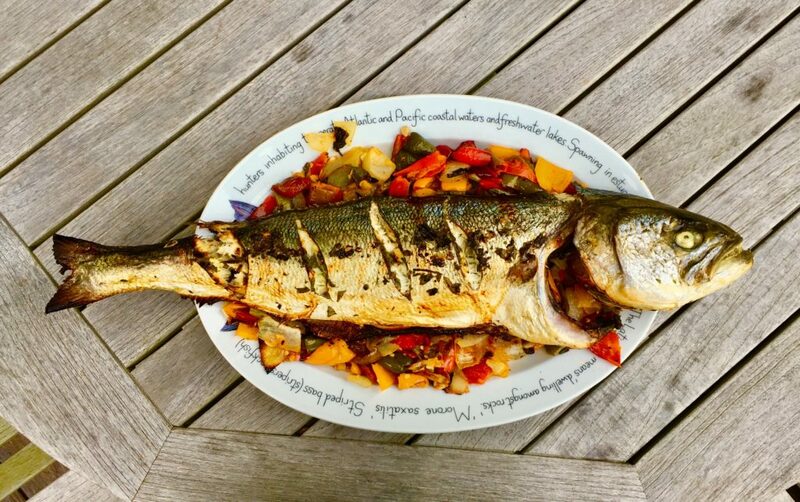 I should have cooked it on a plank–then thrown away the fish and eaten the plank. ALBIE IN THE BAY: You always remember your first. But having caught my first Albie this season, I can attest to the thrill of the fight and the satisfaction of getting the hook up. You’ll feel like the best fisherman in the water when you manage to outsmart one into taking your lure. And Albies offer a run like none other when you do get one on . However, more times than not you’ll feel like an incompetent fool when you pull right through a pod of them at your feet without so much as a tap. Oh, the humiliation. Yet, what choice have any of us had this season in the surf, but to chase Albies for better or worse? Everyone on the beach is singing the blues—or lack thereof. 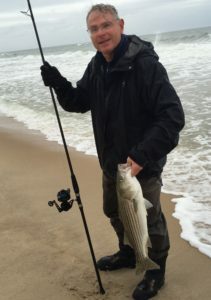 Especially hard to take is the near total absence of Striped Bass in the surf. 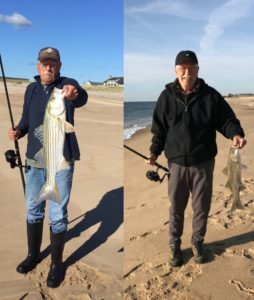 So, it’s Albies in the inlet; Albies at the North Bar; Albies on the jetty, the ocean beaches and in Turtle Cove where October striper blitzes were once the norm, but are now legendary memories. ALBIE IN THE COVE: Where stripers and blues once reigned. What’s it all about [Albie? ], you ask? I wish I had the answer. Not that there’s a shortage of theories for this year’s dismal fall run. 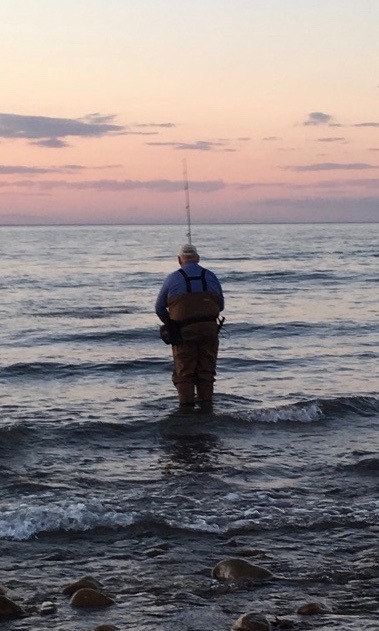 “The fish are still in Rhode Island.” “The commercial gill netters have taken all the fish.” “There’s no bait.” “There’s too much bait.” “The water is too warm.” “We haven’t had any nor’easter storms.” “Nothing’s been the same since Sandy changed the beach structure.” Yada, yada, yada. Take your pick; mix and match. Bottom line is the same no matter: Albies and only Albies are what we have to fish for this season. So it is very clear to me why they call it Albie Fever. Because it is sickening that Albies are the only game in town. No one ever accused Ranger Matt of quietude. He put actions and words to good use cajoling boisterous blues to strike his lure time and again. Sept. 13, 2017: A dramatic transformation occurs on Long Island’s East End comes the beginning of September. 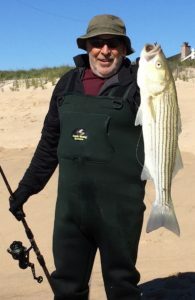 Bikinis and board shorts disappear along the shore, replaced by anglers clad in neoprene waders. 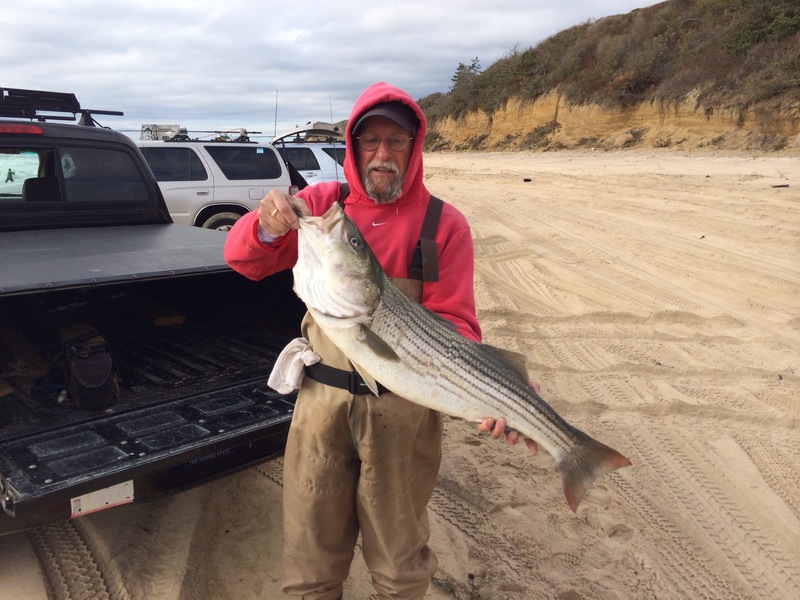 Mid-month, the beaches are fair game 24/7 to prowling SUVs laden with rods and reels. The locals even have a name for the day after Labor Day when the summer visitors purportedly desert the Hamptons: “Tumbleweed Tuesday”. 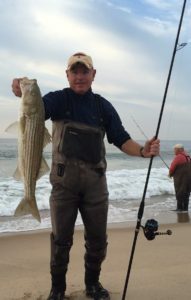 Now, the surf belongs to the surfcasters in search of big bad bluefish and trophy striped bass. 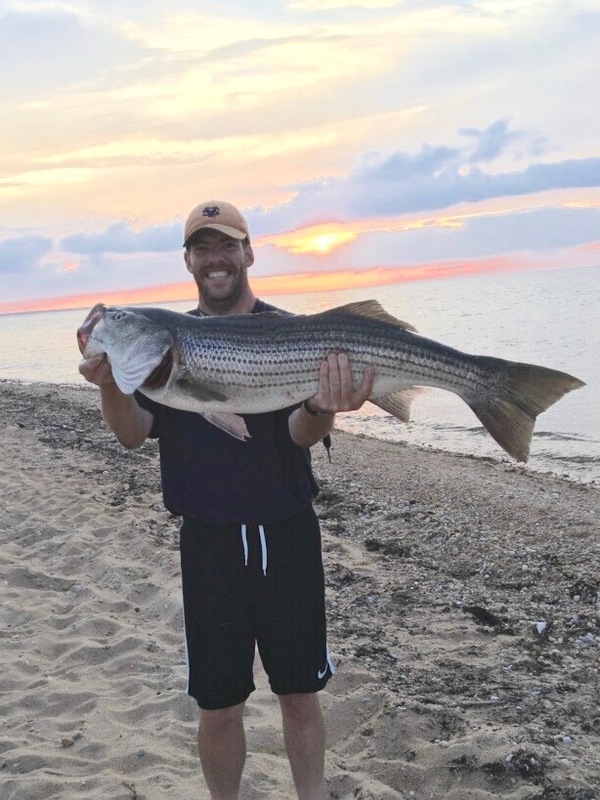 My buddies have been strategically fishing the beaches since June. 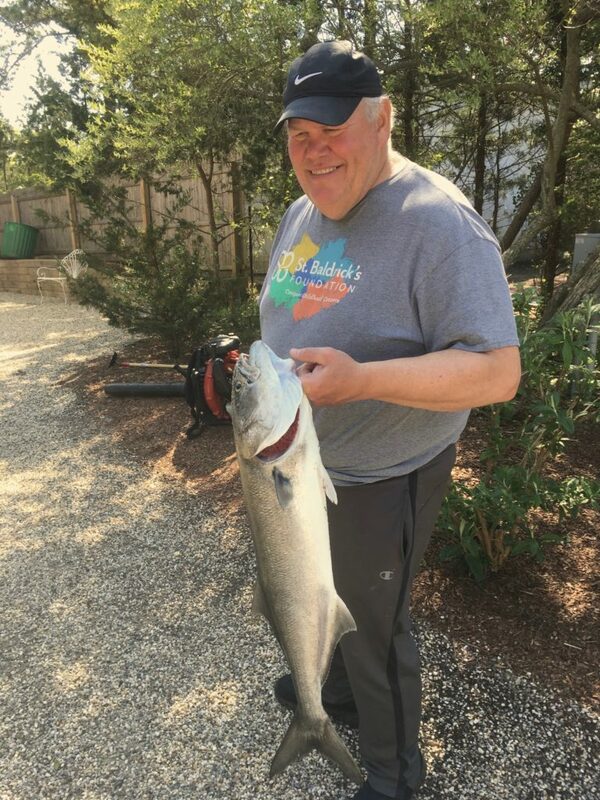 I, on the other hand, engaged only in “transactional fishing” during the summer months: They gave me their bluefish catch, which I fed into my smoker. They got back hickory or applewood cured filets, and/or the breakfast of their choice (perfected my whole wheat blueberry muffins this season, I did). Win win. But as summer dies, my most serious beach time comes to life. September is the official beginning of my fishing season. From now until Thanksgiving, I won’t be hard to find. Head as far east as possible to Montauk Point. Then look left or right. 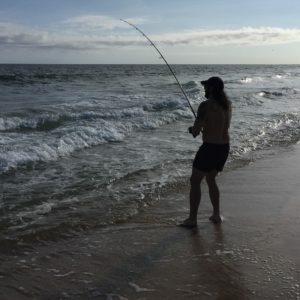 Chances are, you’ll find me waist deep in the surf, most likely casting as hard and as far as I can, hoping for a connection that delivers both sport and dinner. 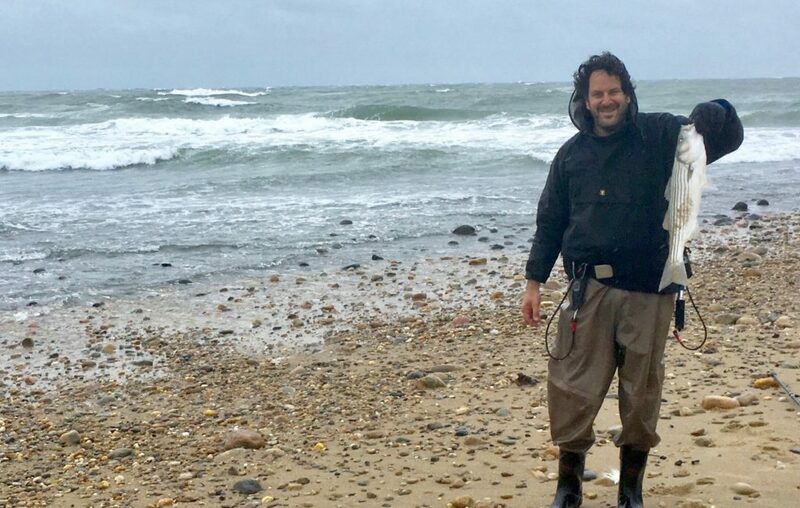 NORTH BAR ROLLERS: Freaky waves rolled in from Block Island Sound leaving us wet, weary and contented. 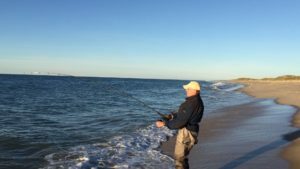 VERIZON CHARLIE: Casting in the magic light at Montauk Point. OUT OF UNIFORM: Amazing Randy hooking up from dry land at North Bar. 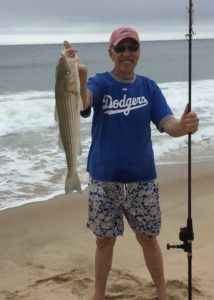 That was the scene on the northfacing beaches of Montauk Point this week, my first real fishing in the surf, after a number of…ahem…”equipment testing” sessions. 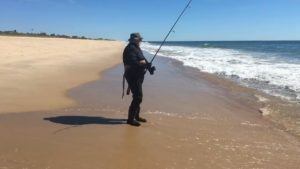 I joined long caster Ranger Matt, the ever successful Amazing Randy and always persistent Verizon Charlie for a foray on the descending afternoon tide. VC left early but Ranger Matt picked a small handful of blues on the North Bar. Matt turned into a veritible fish whisperer, however, when we moved a couple of hundred yards west and walked out on the sandbar at Clark’s Cove. There, Matt literally talked the blues into striking. At first it seemed that his extra 15-20 yards of cast made the difference. Then Amazing Randy and I supposed his key was fishing off the left side of the bar. But when Matt started slaying fish in close, and to the right as well as left, we knew it was simply his magical night. Over and over—Matt orating the action non-stop—fish followed his red and silver Yozuri popper like puppy dogs, lurching and missing and finally gulping it down after three or four tries. 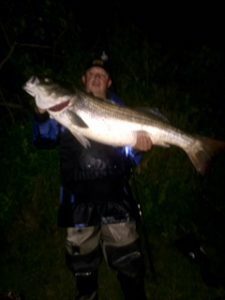 Randy made a gallant effort to keep up and landed a handful of 4-5 pound Tailor Blues. I, however, was skunked. After raising three “hi, goodbye” fish at North Bar, I couldn’t buy a strike for love or money at the Clark Bar. Otherwise, it was everything I could want from a season opener. The water and tide was perfect: the last half of clean, steady-moving, outgoing water. Freaky chest-high waves rolled over us, but the water was warm and the breeze was gentle. Magic light bathed the scene turning the sky from gold to pink-and-gray and finally a deep dusky purple. We left at dark when the tide died–wet, weary and contented. Matt and Randy donated part of their bluefish catch to the “cause” (#feedthesmoker). 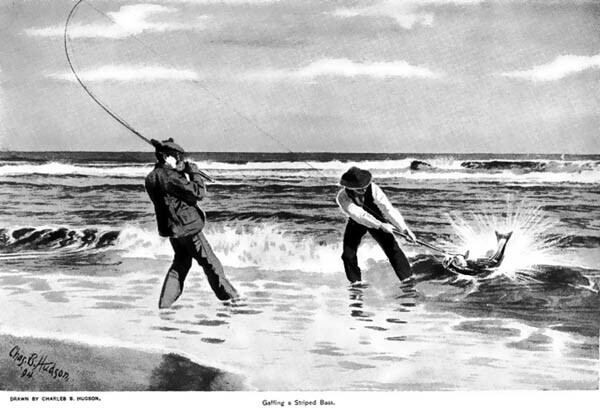 Next up will be the High Holy Days of fall surfcasting. Perhaps there will be smoked bluefish pate for Rosh Hoshanah breakfast. BILLY’S BASS: Evenings find Billy beating the backwaters of Three Mile Harbor for school bass. MORNING BLUES: Gorilla choppers in September will bring Big Brother Frank back for more in October. 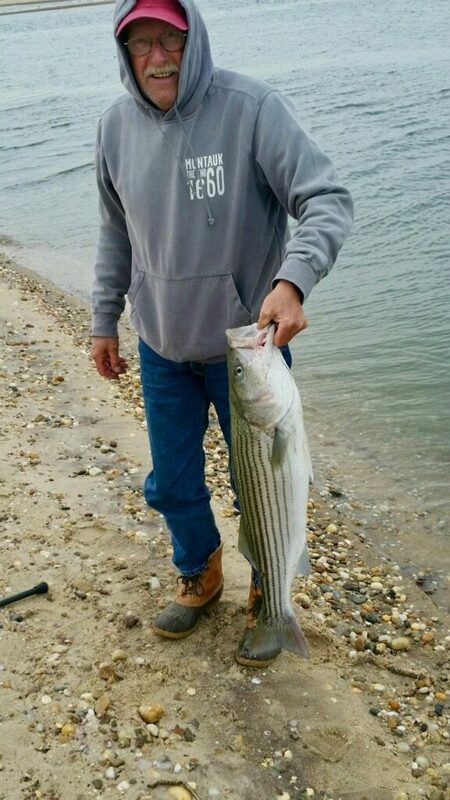 SECRET STRIPER: Ranger Matt with a 20-pounder caught earlier this year at an undisclosed location. Sometimes, fish just want to be alone. 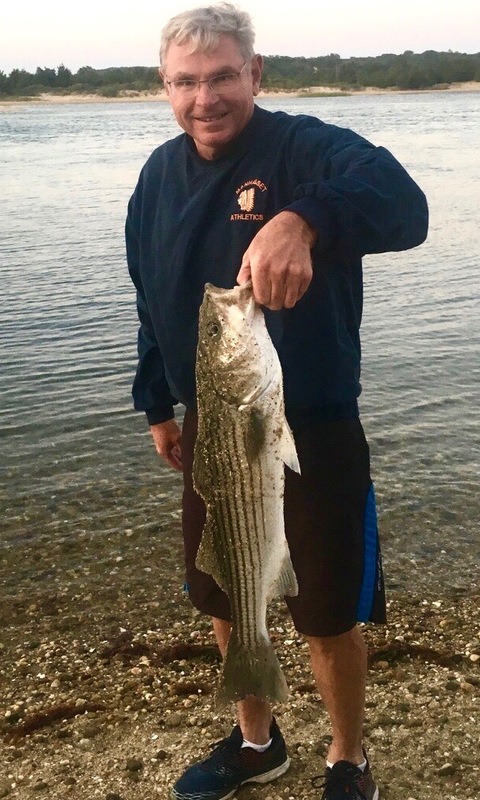 December 16, 2016: You don’t need a calendar to tell you that yesterday was the end of Striped Bass fishing season in NY. The weather report is news enough. 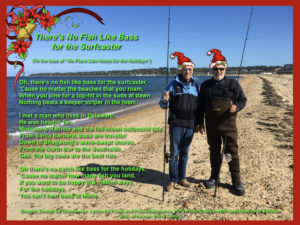 But when the rods get stowed, the stockings get hung and that means it’s time for the annual Fishmas Card from me, Big Brother Frank and the able graphic assistance of sister Chaweenee. 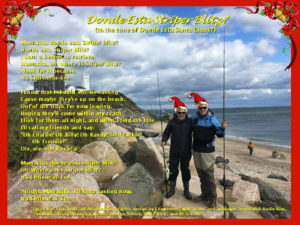 Because it was quite a jolly season of blues and bass fishing in the surf, this year’s tune was an obvious choice. So, with apologies to Burl Ives, Johnny Marks and the legendary Quinto Sisters (what, you never heard of the Quinto Sisters? Well, then check them out: http://www.falalalala.com/the-quinto-sisters-first-to-sing-holly-jolly-christmas-even-before-burl-ives/), I am happy to wish you and yours a Holly Jolly Fishmas! And every goog you meet. Not so much a blitz this year. Would you believe a steady “bite”? 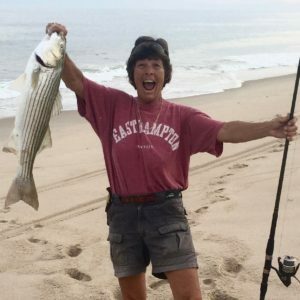 October 9, 2016: My esteemed friend and colleague, Evelyn, roots for the fish. Every time I post a fish pic, Ev gives me the thumbs down. I love that Ev keeps me on my toes (though I wonder where she gets her protein). Surfcasting has never been as much fun since she started reading my posts. 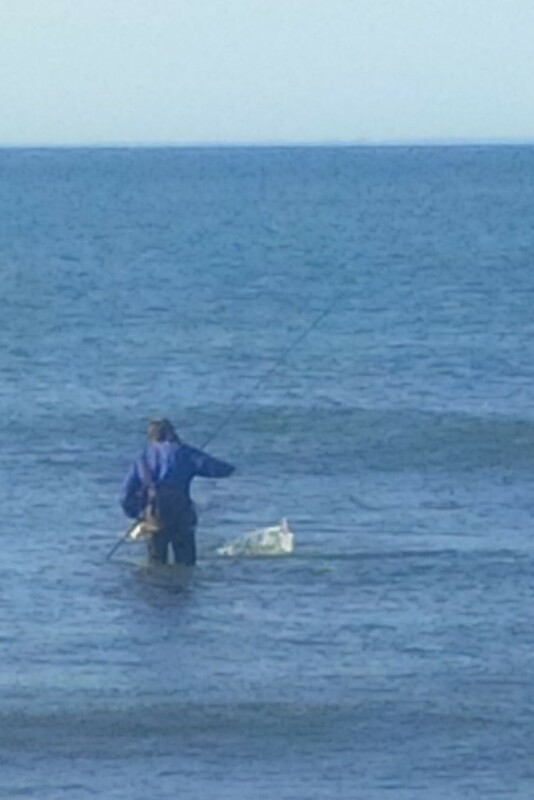 Ev should only know, however, that for every fish I take home, 10 others go back to the sea to swim another day. And for every 100 casts I make from the beach, maybe I hook one fish. The math doesn’t lie. Without doubt, the fish are winning. But it is a historic fact that come the Jewish High Holy Days, the needle tips a bit in the direction of the fishermen—if only just slightly. 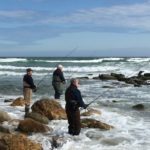 We count on the renowned “Rosh Hoshana Blitz”, for example, to produce the most fruitful days of the fall surf fishing season. This year, however, not so much a blitz. But, would you believe it was a steady bite? No complaints here. What with the fast start of September, Shofar, so good. Fog and rain shrouded the first sunrise of October as The Faithful convened on the beach west of Hither Hills. 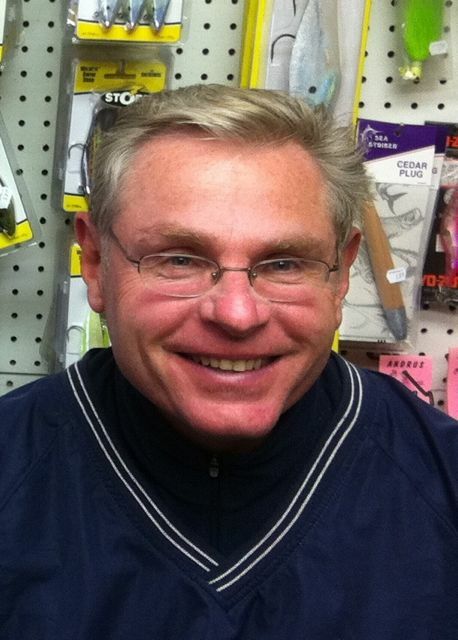 There, Verizon Charlie (VC) took the time to school his fisherman friend, “Sweet Lou”. “Look at that guy,” said VC, referring to a surfcaster 1/4-mile to our west. “He stepped out of his truck, made a cast and caught a fish”. “Hmmm,” I thought silently. “I want to be that guy.” So I slinked away from the coffee klatch. On my second cast, a keeper bass crusing the white water exploded on my lure. Dinner. 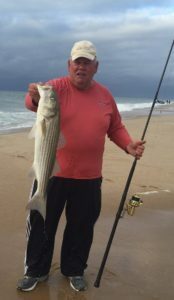 Seeing my bent rod, one of Sweet Lou’s buddies exclaimed, “Hey, look, that guy is on a fish.” Answerd VC: “That ain’t some guy. That’s Fred.” All hands joined me at the shoreline. In the spirit of sweetness and prosperity, the unexpected strike was the sweetest. The sun came out just ahead of Sunday’s sundown start of the holiday and I was optimistic that good fishing lie ahead for the morning. 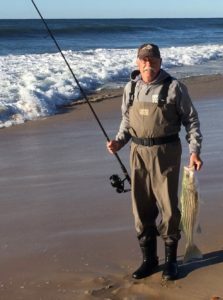 Back at the Hither Hills scene of the crime, Bucktailin’ Billy Black pointed to a patch of water behind the inner sand bar and said: “Here!” as baitfish popped in the wash. Instantly, he was fast to a 28-inch striper. 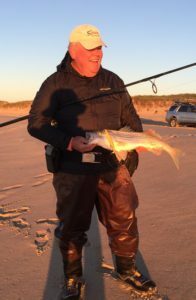 VC, then landed a 26-inch schoolie. We watched a nearby walk-on fisherman pick up a couple of bass and some cocktail blues. Large schools of bunker rode the waves far out beyond the 2nd bar. But there was nothing for me. “Sometimes,” I answered, “a fish is just a fish”. But Ev disagreed. I retired to my desk and vowed to perform good deeds until the tide changed. My respite did not last long. 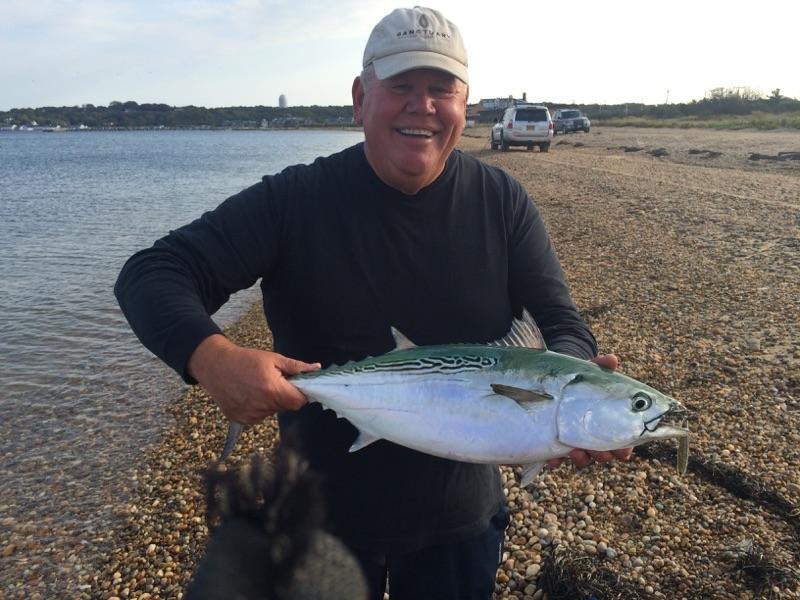 A very urgent but abbreviated “fish call” came from VC at 1pm: “15-pound blues at Fort Pond Bay. Gotta Go”. 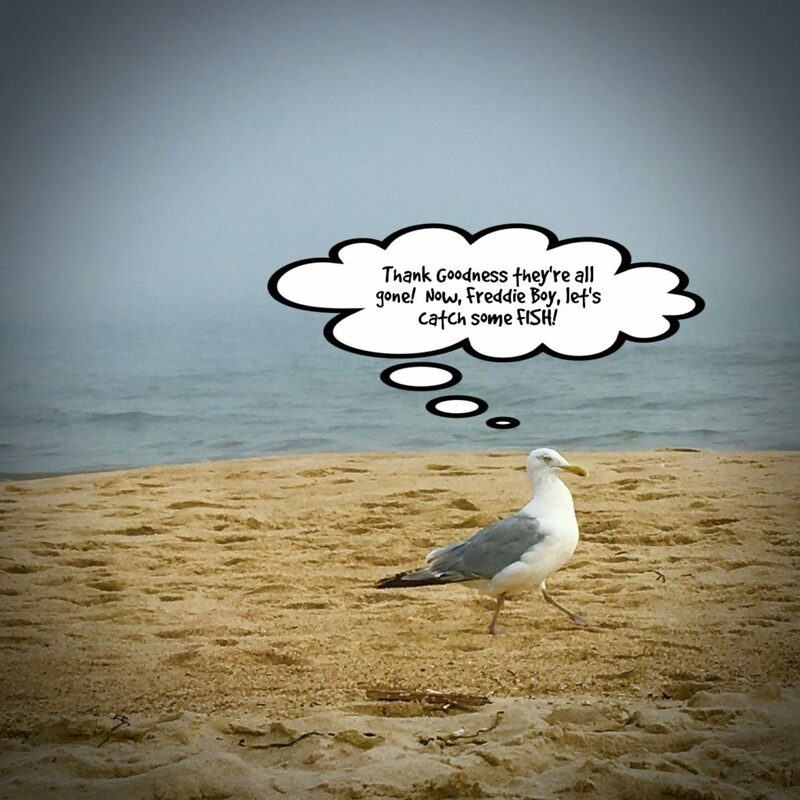 Among the hallowed rules of surfcasting is to never ignore a fish call or text from a reliable source. Sources don’t get anymore reliable than VC. So I hustled to Montauk and got in on the action. It was bathing-trunks fishing on an unseasonably warm and sunny afternoon. 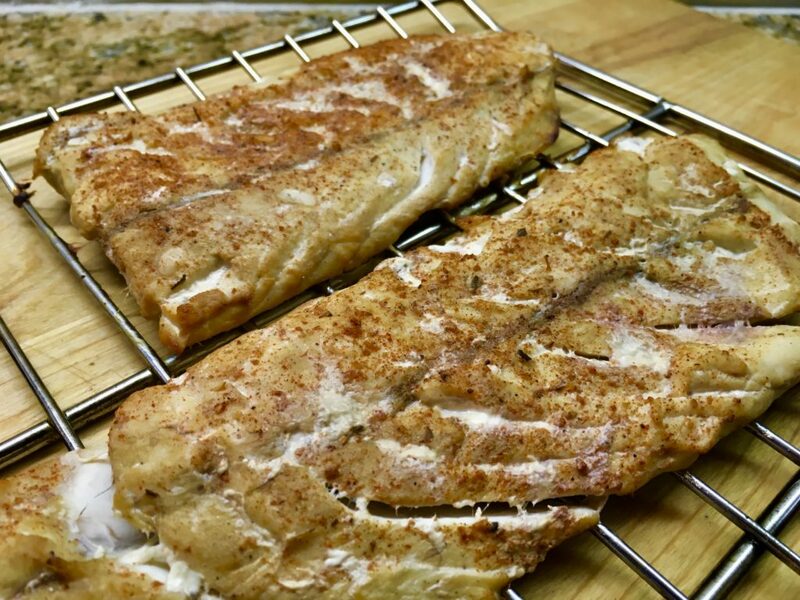 But these bluefish were anything but placid. They erupted from an otherwise tranquil sea, pouncing vengefully on our surface lures. 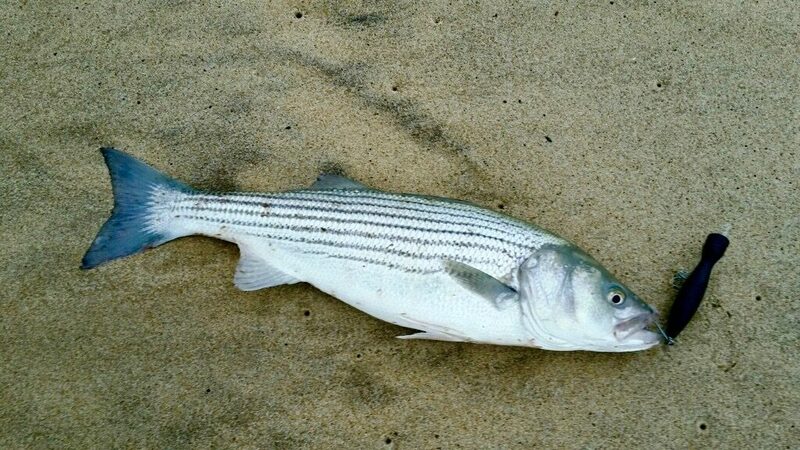 They fought with three times the power of a similarly sized striped bass. 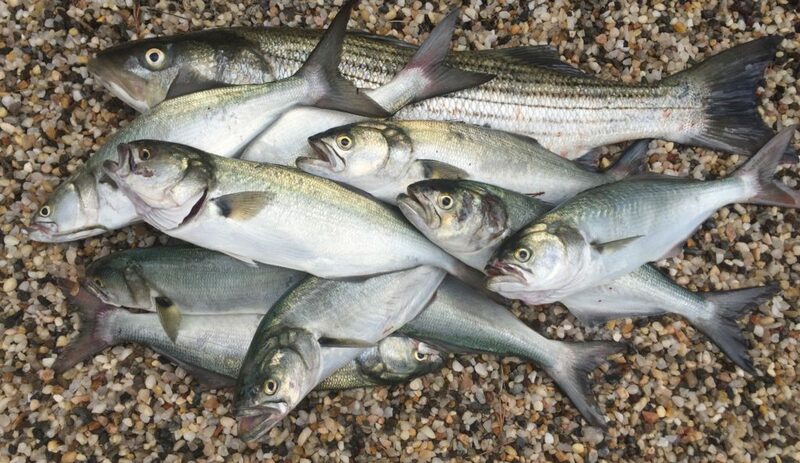 These bluefish stealthily chased 7-inch menhaden bunker, swallowing them nearly whole after one viselike chomp (Click here for extended video). Two vicious blues bit off my line and lures. But I managed to land two other gorillas, weighing 12.5 and 14.5 pounds. Feed the smoker! On the second day of Rosh Hoshanah, came the big wind. 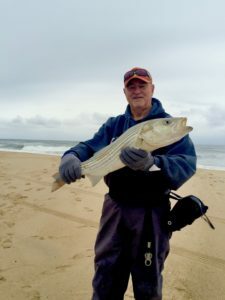 VC and I returned to the sandy ocean beach where we each had a short bass that we returned to sea. 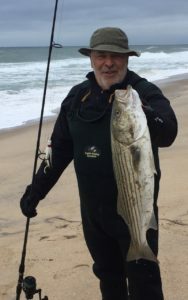 The honking NE wind sent me hunting to Montauk’s North Bar, even though the incoming tide was wrong. There, finally, I found the proverbial Rosh Hoshanah Blitz. Only one problem. 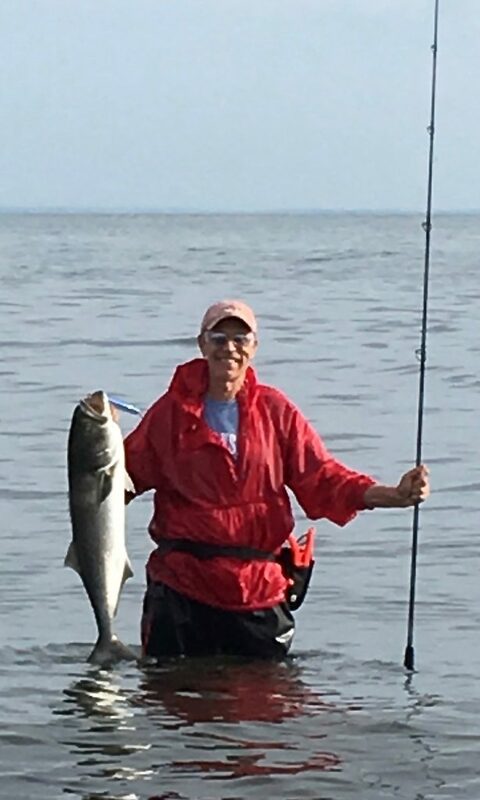 The fish—busting, boiling and accompanied by squawking gulls diving on the bait the bass had trapped in the rip—were beyond anyone’s reach. 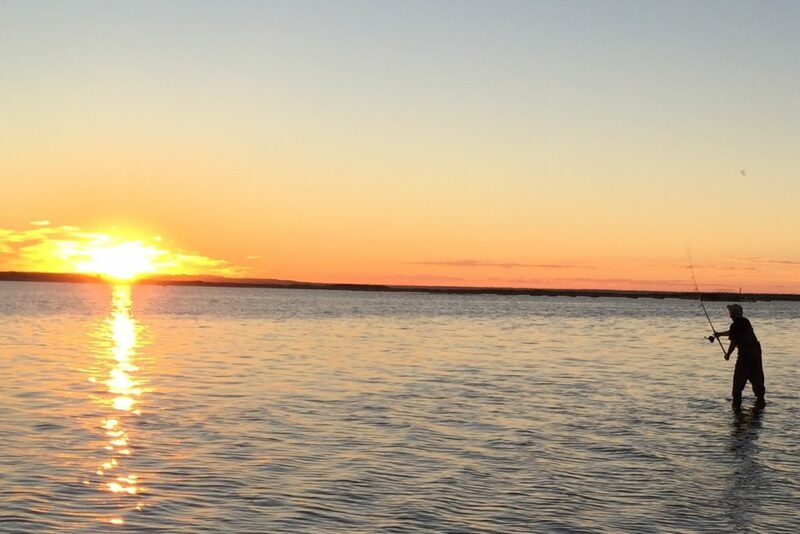 Later that day, nearing sundown, the outgoing tide was just right for fishing the North Bar. Sure enough, the fish were in same place. We could see them. But we couldn’t reach them. No argument there. 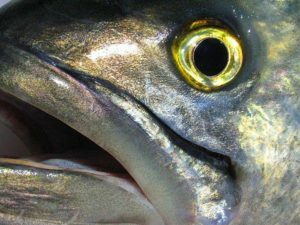 I am the first to admit the fish are far wiser than I. It’s the main reason we call it fishing—and not catching. 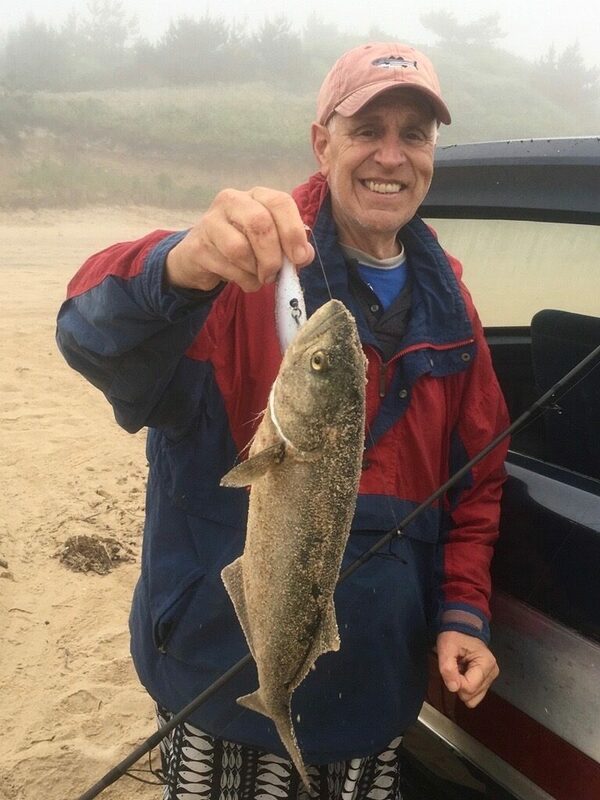 So, Ev, my dear friend and fish monitor, I look forward to your future comments as we approach the next fall surfcasting milestone: The lesser-known, but up-and-coming, and sometimes equally-satisfying “Yom Kippur Blitz”. Here’s looking at you Ev.